Houston Texans beat writer John McClain is reporting TE C.J. Fiedorowicz (concussion) "may retire" this offseason. 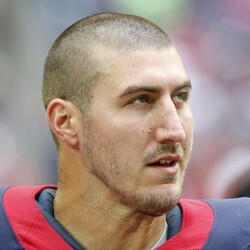 Fiedorowicz, who suffered four concussions since December 2016 -- his latest occurring in Week 13 of the 2017 season -- is considering retiring from the league this offseason as a result of his recurring head injuries. However, although his career is hanging up in the air, the 26-year-old tight end told the press that he plans on reporting for offseason activities and taking part in OTAs. In five games last season, Fiedorowicz only accumulated a 14-127-00 stat line.